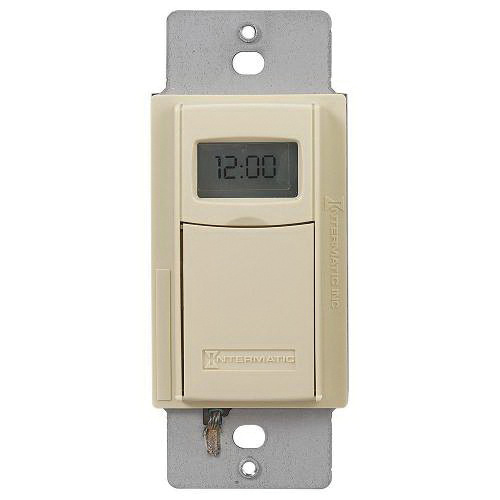 Intermatic 3-Way 1-Pole Programmable electronic countdown timer with 1 sec - 24 hour timing range, has voltage rating of 120 - 277-Volt AC 50/60-Hz or 12 - 28-Volt DC and current rating of 16-Amps at 208 - 277-Volt AC. This timer has a dimension of 1.75-Inch x 1.1875-Inch x 4.125-Inch. It has contact rating of 16-Amps at 208 - 277-Volt AC for inductive, 20-Amps at 120 - 277-Volt AC for resistive, 15-Amps at 120-Volt AC, 6-Amps at 208 - 277-Volt AC for tungsten, 4-Amps at 12-Volt DC and 2-Amps at 28-Volt DC. This ivory colored timer with auto OFF action, has maximum load rating of 1 hp motor at 120-Volt AC and 2 hp motor at 240-Volt AC. It consumes power of up to 1800 - 5540-Watts and supports installation on a wall/decorator switch plate. This timer has temperature rating of 32 to 122 deg F. It is great for fan, library/classroom light, hid/fluorescent lighting, par light, heater, recreational vehicle, air conditioner, porch light and carriage light. Timer is UL listed, cSAus certified, UR recognized and ADA compliant.